Puzzle Pirates Forums - View Thread - Should lazing experience be forbidden? 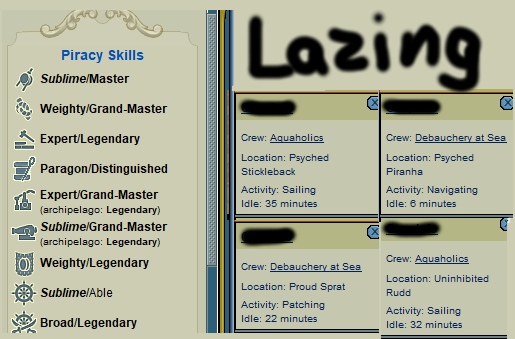 Forums » List all forums » Forum: Davy Jones' Locker » Thread: Should lazing experience be forbidden? Should lazing experience be forbidden? Lately there has been a certain individual on the Obsidian ocean lazing experience nonstop. Even when he got called out it did not make him stop. "Normal idling is fine. Automating any form of input into the game to prevent idling off is not permitted." He lazed 3 Sublimes (going for his 4th!) and other high experiences already. The target of this thread is not the pirate (although I wish they'd swipe his stats), but rather the game design issue and the apparent endorsement. Why is this behavior tolerated and can we replicate the procedure without consequences too? If not, could you then please take action and make "Booched" duty reports not give any contribution towards experience? I have reported this multiple times with no avail. I think it destroys a big aspect of puzzling and it feels very unfair to many hard working pirates. Re: Should lazing experience be forbidden? Ask the Owl farmers no one gives a hOOt. Cheaters are all over, no one cares. Experience doesn't mean anything, and they're not cheating or breaking any rules. I get you don't -LIKE- it, but that doesn't mean something "needs" to be done about it. Should manipulating the speed of a puzzle be forbidden? Should aiding in the sale of bots be forbidden? Should assisting ban evaders be forbidden? I don't see how you can break all those ACTUAL rules while playing on your current account alone, and still think you have the moral high ground. 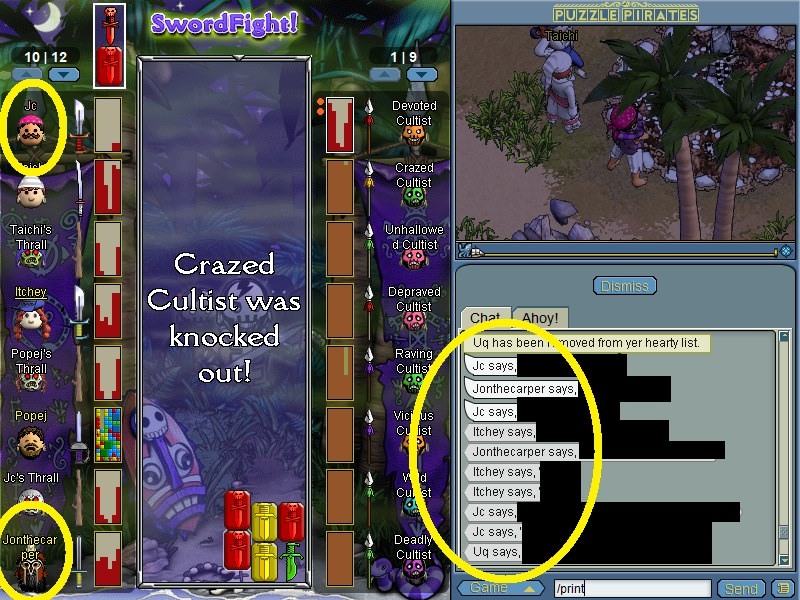 This thread is just the next step in your continued harassment of Ozzy, if it wasn't you would have picked a different example, while not blatantly advocating for a stat reset. Who are you to throw accusations around? I don't even think I've seen you in game let alone talked to you. I am not the person you are looking for. Yes, breaking any of the stated rules should get you banned indefinitely, but I'm not breaking any unlike your friend? I'm not the Mehfailz guy you and a handful of other pirates accuse me of being, and I didn't even know who that guy was until a few people told me. I honestly dont get why people are even more hostile than back in the day. Just for the record, this is my only account on which I even contributed a winning egg design. Do I look like a rule breaker to you? Do I look like I want the best for the game? Do I look like your friend? I know that I have called out Ozzy in global chat a few times, but so have other pirates. I explicitly removed the name (until you mentioned him) to avoid witch hunts on the forums, but congrats for calling him out. The interest is to get this game design issue resolved as petitions lead to nowhere, not to attack your friend publicly. It is praisable that you want to cover the back of your friend, but please refrain from defaming and harassing people publicly on the forums, and I will return the same favor in game from now on. Other than that please stop spreading rumors, I don't want to have to defend myself over nothing. Usually I choose to ignore all forms of harassment in-game, which is why I have you muted in-game. You could have very simply made this post about an "individual who is lazing for experience", without making it about me as an individual. You've chosen to do this by including an image of stats, which is fine, except which-hunts aren't really allowed. It's also important to point out that I'm not the only one doing this, so maybe you should make this less about me. But included my crews and stats, very subtle. I've also been playing the game, so nonstop is a bit inaccurate there, but your point is understood. If you take the time to read other threads, idling experience has already been discussed by players, along with quotes and images from OMs. For the record, my personal discussions with the OMs, have been very clear. Idling through the lazing mechanic (let's call it), is permissible. And you've even pointed out they've told you this too. I'm not breaking any rules, since I am not using inputs, as I am sure you've probably figured out since your reports aren't achieving what you desire (clearly). I understand players feel passionately about different parts of the game that's fine, but this is a very subtle attack on my person, which only adds to the list of harassment I've received from you. This whole thing could have been approached with much better taste by replying to the other thread on this topic. Please be more objective in the future. I understand that you clearly feel passionate about this, but there is no need to create a personal attack. I would have thought that my having muted you would have made it clear that I want nothing to do with an individual that harasses others. Please stop harassing me. Multiple petitions lead to a neutral statement such as this, but to no action: "Normal idling is fine. Automating any form of input into the game to prevent idling off is not permitted." Seems very definitive to me. I chose your pirate because you were the most prominent example on the ocean I'm playing on. The stats were very well intended to be included, but the crews not so much - my mistake on that part (just did some quick editing). Thanks for understanding my frustration though, and thanks for responding to this thread clarifying your point of view. I still do not endorse your procedures, but I know yer point is valid until they change their stance. Until then, happy puzzling I guess. I'm sorry for the inconvenience this might have caused, I did not know there was an older thread already in place. I'll post there from now on. If you're not smart enough to know that when changing your discord name from "Mehfailz mod of botting forums" to "Jonthecarper" (and displaying the same picture) everyone you have messaged can also see that name change, I don't think any amount of schooling is going to aid you. I did not know there was an older thread already in place. Of course you didn't, literally quoted the petition linked there in the OP. You seem to be a barnacle liar too. That is not true, I never had either name on discord. But it is interesting that you claim to have him in your contact list, is there any reason to it? Are you both trying to get me banned?Also if I recall correctly that CI was from back when I made the pirate, so I apologize for forgetting a random encounter with you after half a year. I am Foraging like anyone else does, else I wouldn't be at Solid/Legendary holding the Ultimate trophy. If there are a few fortunate spawns then so be it, thats how swingy CI foraging can get. I don't even think I beat you - does that make you a speedhacker? I stated that I wrote multiple petitions to the oceanmasters about this topic, do you think the response from them would be any different in game? I got the exact quote as a response in game and if you'd like I'd send them a petition just to verify that I am not a liar. Now please stop derailing this thread as it serves no purpose anymore - the discussion should be in the thread Ozzy linked to me.